I will show you creating contextual alerts by using built-in Bootstrap classes along with using different plug-ins to create alerts while using Bootstrap framework. By using .alert built-in class in an element like <div>, <p>, <span> etc. 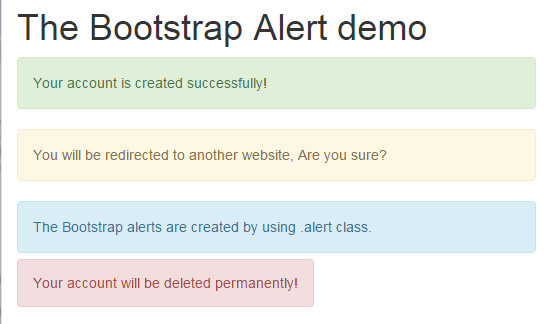 you can create contextual alerts in Bootstrap. To give it specific look, for example, if notifying a user for deleting an account permanently, you can use .alert-danger class along with the .alert class. 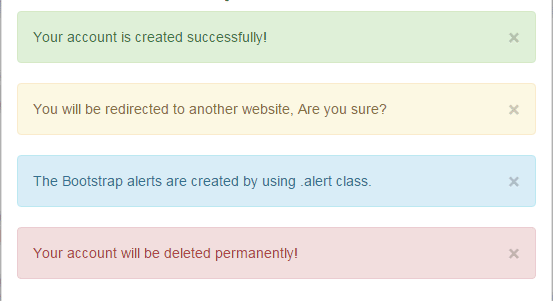 Similarly, for showing a success message after performing some action, use alert alert-success classes in that element. <div class="alert alert-warning alert-dismissible" role="alert">You will be redirected to another website, Are you sure? You can see all alerts code in the demo page. So it will hide automatically. Note: You may also use the hide method of jQuery to close alerts without fading effect immediately. In this demo, I have used bootbox.js plug-in to create three alerts. Basically, this plug-in uses the Bootstrap modal plug-in, so the alerts will not let you interact with other parts of the website unless some action is performed. First have a look at alerts by using this plug-in which is followed by its setting up guide. The second button, “Trigger confirm alert” fires the confirm alert that warns to look before proceeding. The user is given the option to press Ok or Cancel buttons. If you press Ok, another simple alert is shown that confirms the action is completed. In above example, the # bootalert, #confirmalert and #promptalert represent the button IDs. You can see the complete code in the demo page as well. As such, bootbox.js is using the bootstrap modal plug-in underneath: you may change the look and feel of these alerts by changing it CSS classes. For example, the modal-header class to change the header of alerts, modal-body class to change the look and feel of the body and so on. Note: You have to place this CSS after including the Bootstrap CSS. Start using bootbox to create alerts as shown in the demo. Credits: You may download bootbox plug-in here.